It's been nearly two weeks since Hurricane Maria made landfall in Puerto Rico. But the island is still a disaster zone. Cell service remains down. Cash is scarce. And virtually no one has electricity. President Trump, who is visiting the U.S. territory on Tuesday, has boasted of an effective and efficient recovery operation. 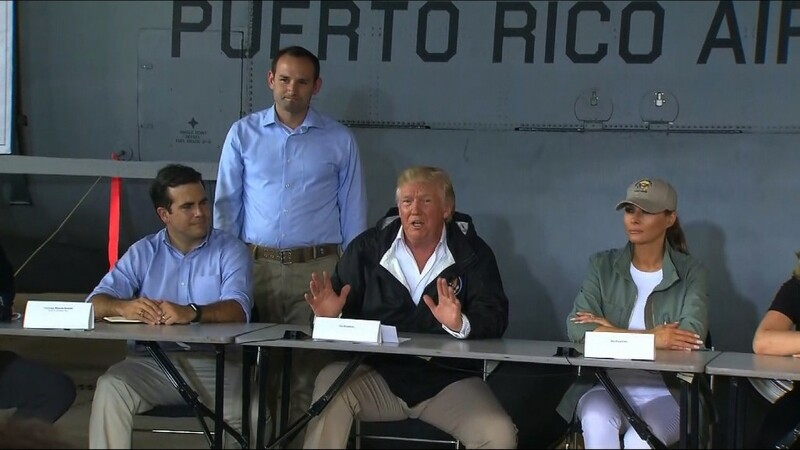 He said the government's hurricane response efforts in Puerto Rico was "just as good" as its work in Texas and Florida as he boarded Air Force One earlier this morning. But people on the ground still describe widespread havoc. "My people are suffering. This is a disaster," Carlos Mendez, the mayor of Aguadilla in western Puerto Rico, told CNN. Here's how Puerto Rico looks right now. About 88% of cell sites in Puerto Rico remained out of service on Monday, according to the Federal Communications Commission. That's made it all but impossible for those affected by the storm to get in touch with family and friends, both on and off the island. It's also complicated relief efforts, making it harder for those in need to call for help. Cell phone companies are working hard to restore service by sending chartered planes with generators, satellite equipment and personnel. But they don't expect the situation to be fixed any time soon. "It's going to be a long road to recovery," T-Mobile (TMUS) told CNNMoney on Sunday. A mere 6.9% of the island has electricity, according to the government of Puerto Rico. Though the Army Corps of Engineers has started patching the power grid, full restoration of power could take months. "There's a lot of poles in the streets," said Edwin Rosado, 45, from Cidra, Puerto Rico. In the meantime, emergency generators are powering many hospitals and food banks, though the diesel fuel that's kept generators up and running is also scarce. The same goes for gasoline. Though 74% of gas stations are running again, queues often span blocks. As of Sunday, an estimated 180 commercial bank branches and credit unions were open -- double the number from two days earlier, according to Christian Sobrino, a member of the Financial Oversight and Management Board of Puerto Rico. But roughly a third were located in and around San Juan, the commonwealth's capital. The problem has been made worse by the lack of functioning ATMs. About 27% of ATMs are currently operating, according to Puerto Rico's government. Many towns only have one or two cash machines, which makes getting money difficult. On Sunday, several dozen people waited two hours in one ATM line. They could only withdraw a maximum of $40. More than half of people in Puerto Rico still don't have running water to use or drink. The government said Tuesday that only 45% of people can use their taps right now. A number of supermarkets also remain closed. About 65% have reopened, according to local officials, though many are rationing food. On Sunday, FEMA said that it's expanded its delivery of food and water throughout Puerto Rico. The agency has now delivered food and water to all 79 municipalities in Puerto Rico, according to Alejandro De La Campa, a FEMA coordinating officer. When Puerto Rico's airports are running at full capacity, 160 commercial flights take off daily. Right now, just 39 flights are hitting the skies each day. According to the government, 35 of the flights are domestic and four are international. Those numbers don't include the many military, charter and relief operation planes that are also flying in and out of Puerto Rico. -- CNNMoney's Patrick Gillespie contributed reporting.